When both Lori Kleppe and Sarah Greene received news that their husbands would not be returning home from their military service, they lost more than their partners and best friends -- they lost the fathers of their children. One charitable organization in particular stepped in to help pick up the pieces, and now these women are ready to pay the kindness and compassion forward. On Veterans Day, the Children of Fallen Patriots Foundation announced its collaboration with yarn manufacturer Caron United in an effort to knit the world's largest Christmas stocking, which will debut in December 2015. Fifteen cents from each skein of Caron yarn will benefit the organization, which has provided more than $7.5 million in scholarships and financial assistance to families like the Kleppes and Greenes since 2002. 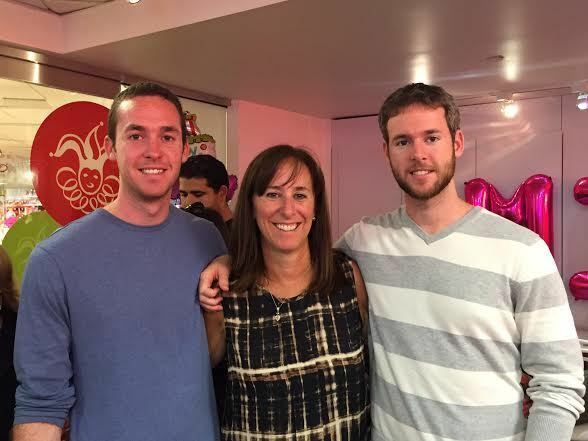 Kleppe, 55, lost her husband Edward, a Navy Reserve helicopter pilot, in a training accident in 1990 when she was at home with their 2-year-old son Andrew and expecting their younger son Evan. While her toddler was too young to understand his father's death, Kleppe struggled with becoming a widow as well as a single mother. But even more so, she worried about her boys' futures. "We had already talked about college savings back then," Kleppe told The Huffington Post. "I had started putting away money and we got social security for a long time, so I put that away for them thinking about college. I was semi-prepared." 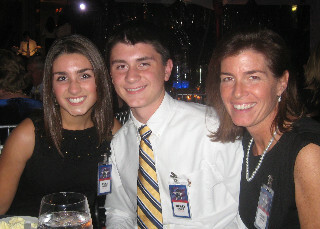 It wasn't until her sons were already enrolled in college that someone from Children of Fallen Patriots contacted her. Shortly after, Kleppe found the group paying her sons' tuition directly and reimbursing her personally for the loans she had previously taken out. Greene, 50, grieved her husband's death alongside her children from the moment she heard the life-changing news. A Marine Corps Reserve helicopter pilot, David was shot in the neck and killed instantly while providing air support during a ground battle in Iraq in 2004. This was less than three weeks before he was scheduled to return home. He was survived by his wife, 10-year-old daughter Jena and 8-year-old son Wesley. "I just kept telling them, ‘We’re going to be okay, we’re going to be okay,' Greene told The Huffington Post. "It was daunting to raise two kids who knew their dad, thought he was coming home, and suddenly didn't -- the floor was pulled out from under them. We were already a very close family, but it definitely tightened our bond that much more. We call ourselves the tight little tripod." As the kids reached their high school years, Greene felt strongly that their attending college was not an "if" but a "when." Searching endlessly for scholarships, fellowships and other financial assistance, she discovered Children of Fallen Patriots and made a phone call that resulted in the funding of her two children's private university educations, and even some internship networking opportunities along the way. Both mothers sought and found solace in this foundation when few other options existed for their families regarding their dreams of higher education. The support Children of Fallen Patriots offered fulfilled the wishes of the deceased fathers and now-single mothers who had always planned on providing for their children until events beyond their control hindered them from doing so. But it wasn't just the money that made a difference -- it was the compassion of those behind the foundation that inspired the women to get involved beyond the scholarships and donate what they could in return. "My kids never grew up surrounded by any kind of real appreciation for service, other than from us," said Kleppe. "When they got involved with Children of Fallen Patriots, it was the first time that other people were acknowledging around them the sacrifice or the willingness to serve or any of the honor that would go along with being in the military and giving your life to it. There’s nothing they wouldn’t do for this group. Sure, they're thankful for the money, but there’s a lot more that they get from it. They’re treated special, and it’s a big deal." Greene's family is equally grateful for the foundation's support. "They have embraced us so nicely, and it truly feels like a family-style support," she said. "I just felt like these people really do care, and it does nothing other than make me magnetically drawn to helping them. They didn’t know us from anybody and they were still there to help. I want to do whatever I can to help them because they’ve done so much for us." Greene, along with Kleppe, did just that after the foundation announced its world's largest Christmas stocking project last month. They met for the first time after both volunteering to participate in the video explaining the stocking construction project around Veterans Day. Kleppe, a longtime knitter, gave Greene her first lesson in the craft, as well as the confidence that she would, in fact, be able to contribute to the lofty project. While Greene is focusing on knitting one blanket square first, Kleppe hopes to provide at least five or six by this time next year. "It’s calming," said Greene about her new skill. "It’s a centering thing that you’re doing and it is for a great cause. It’s something I can see myself doing in the future." Kleppe, who is also looking forward to resuming her hobby that she hasn't used much since hand-knitted sweaters were in style, is simply happy to be able to help this group that has given so much to her family over the years. "All you have to do is be around this group of people to want to be involved with them," she said. "They treat us like royalty, to the point where I think, ‘Oh my god, I’m not that special. Let me do something for you.’ I would like do whatever I can to pass it forward to other people, not only the money but the appreciation."